description: NCEI home page with information, data access and contact information. abstract: This dataset contains a high quality operational Environmental Data Record (EDR) of Aerosol Optical Thickness (AOT) from the Visible Infrared Imaging Radiometer Suite (VIIRS) instrument onboard the Suomi-NPP satellite and is produced by the NOAA Environmental Satellite, Data, and Information Service (NESDIS). 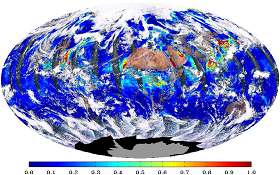 The algorithm that is used to derive the VIIRS AOT is based on an algorithm originally developed for the Moderate Resolution Imaging Spectroradiometer (MODIS) sensor but is adapted and improved upon for use by VIIRS. The algorithm utilizes eleven different spectral bands ranging from 0.412 to 2.250 microns as well as the Angstrom Exponent to calculate values stored as 96 x 400 arrays of 16-bit integers with a matching scale stored in each granule. The spatial resolution is 6 kilometers (km) which is derived from an intermediate product (IP) of 8 x 8 750 meter pixels. The temporal resolution provides global coverage daily. By default, IDPS VIIRS AOT data obtained from the Comprehensive Large-Array Stewardship System (CLASS) are distributed in four 86-second granules in Hierarchical Data Format v.5 (HDF5) with metadata attributes included. It is important to note that the Aerosol Particle Size Parameter (APSP) is included in this EDR and is reported as Ångström exponent. purpose: The S-NPP VIIRS aerosol products are designed for use by the climate, air quality, research, applied, private, governmental, and military communities for the purpose of research, forecasts, communication, and policy decisions. fileDescription: Example of global Aerosol Optical Thickness (AOT) EDR at 550nm overlaid on top of a true color (RGB) image. description: Overview of the GCOS Essential Climate Variables. description: Instructions and examples for ISO keywords. useLimitation: There is a significant decline in quality between Aerosol Particle Size Parameter (APSP) over ocean compared to over land. Using APSP over ocean is not recommended. For a complete description of use limitations for this EDR, see the Algorithm Theoretical Basis Document (ATBD). otherConstraints: Cite as: Kondragunta, Shobha, Laszlo, Istvan, Qiu, Shuang and NOAA JPSS Program Office (2012): NOAA JPSS Visible Infrared Imaging Radiometer Suite (VIIRS) Aerosol Optical Thickness (AOT) and Particle Size Parameter (APSP) Environmental Data Record (EDR) from IDPS. [indicate subset used]. NOAA National Centers for Environmental Information. [access date]. title: Suomi-NPP VIIRS aerosol algorithms and data products. description: Jackson, J., Hongqing, L., et al, (2013), Suomi-NPP VIIRS aerosol algorithms and data products, J. Geo. Res. Atm., 118(22), 12673—12689, doi:10.1002/2013JD020449. fees: In most cases, electronic downloads of the data are free, however fees may apply for data certifications, copies of analog materials, and data distribution on physical media. description: Dataset landing page with general information and links to access the data. description: Access and download data tar files by date and product for the previous 85 days. The directory structure is as follows, date(yyyymmdd)->instrument family->product. description: Search the data archive and submit an order for the dataset via the interface. description: STAR project landing page with documentation and contact information for the dataset. statement: These data were produced by the JPSS Interface Data Processing Segment (IDPS) and are archived at the NOAA National Centers for Environmental Information (NCEI). description: For a complete description of the processing steps, see the Algorithm Theoretical Basis Document and Data Flow Diagram. description: Processing documents to include Algorithm Maturity Reviews, Readmes, and User Guides. description: The AOT algorithm reached beta maturity status. description: Table with algorithm maturity reviews by product. description: The AOT algorithm reached provisional maturity status. description: The AOT algorithm reached validated maturity status. description: Source dataset landing page with general information and access links for the dataset. maintenanceNote: Bulk metadata change applied on 2018-11-05. See version control repository history for metadata change details.